The process of classifying, recording, analyzing, and reporting financial data, in a nutshell, is known as Accounting. Just as with your personal finances, businesses need an effective and efficient way of keeping track of their money, and the method of doing so often varies with each business. Its quite common for small businesses to hire accountants to handle all of the bookkeeping. And many companies use accounting software, such as CheckMark, Account Edge, and the most popular, QuickBooks. Double-entry accounting uses a system of debits and credits. Accountants tend to use a general ledger to track the money as it flows to and fro. Each financial transaction is recorded on a balance sheet. A balance sheet provides a snapshot of a business’s financial condition. Recording any and all business transactions: Well organized businesses keep a daily record of all business transactions, usually in sales, cash-receipt, and cash-dispursement journals. Accountants usually have several journals to keep track of. Making necessary adjustments to the general ledger: For any items that aren’t recorded in daily finance journals, such as accrued interest, taxes, or bad debts, general ledger adjustments make it possible for businesses to account for these missing items. Businesses can therefore match revenues with any expenses within each accounting period just by adjusting these entries. Closing the Books: Once everything is accounted for, including all revenues and expenses, all net profits therefore are posted in the owner’s equity account. Usually, before the new accounting cycle begins, all expense and revenue accounts are zeroed out, meaning no balances. Preparing the Statements: Income statements, balance sheets, statements of capital, cash-flow statements and other reports are all put into one report: a financial report. These reports summarize all of the financial activity for the given period. In order to show the financial “health” (or decline) of a business, it is necessary for accountants to create financial statements for a business at the end of their accounting cycle, which may be annually or more frequently. Business owners and managers use the data in financial statements for a number of reasons, and many people who are not only on the inside, but on the outside, of the company, use these statements as well. These statements provide information on several financial factors, and many use the information to chart the course of their companies, keep any tabs on costs, monitor their cash flow, project revenues and expenses, and of course plan for the future. These statements also provide current and prospective employees with an idea of how the company is performing. These statements are also incredibly important to stockholders and investors because they help them to track a company’s investments and therefore protect their investments, and also guide them for new investments. And for banks, these statements help to decide whether or not a company gets a loan. Preparing tax returns and reporting financial data to the IRS (Internal Revenue Service) is a stressful part of an accountants job, and financial statements help to ease this process. In general, dealing with the IRS is a hassle…so these statements make it a little less unbearable. It is extremely important that your accountant or you get a good handle on all of the common financial reports that your business produces because so many people and institutions will rely on the information in them. If you feel that you need to “outsource” your accounting, bookkeeping, etc., there are several sources in the accounting world that can help you with this. 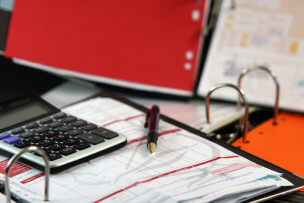 Go to accountingpage.com for a directory of accounting, bookkeeping, and tax services from various businesses. However if you are interested in finding software to do it yourself, go to Quick Books Web Site. Their packages start from $99.95 and go up to $3,000, so there should be something in the middle that could be right for your company.